2012-06-02. New. Ships with Tracking Number! INTERNATIONAL WORLDWIDE Shipping available. Buy with confidence, excellent customer service! New York: Delacorte Press, 2012. SIGNED by the AUTHOR on the Title page. Signature only. Novella sized book. A First edition, First printing. Book is in Fine condition. Boards are clean, not bumped. Fore edges are clean. Interior is clean and legible. Not remaindered. No dust jacket as issued. All-Ways well boxed, All-Ways fast service. Thanks.. Signed by Author. First Edition. Hard Cover. Fine/Not Issued. Delacorte Press. Hardcover. 0345544293 New Condition. . New. Delacorte Press. Hardcover. 0345544293 Please allow 4 - 14 business days for Standard shipping, within the US. Thank you for supporting our small, family-owned business! . Fine. 2012-11-06. First Edition (US) F.
New York: Delacorte Press, ., .. First edition. First U.S. edition. Signed by the author. Fine in printed boards. 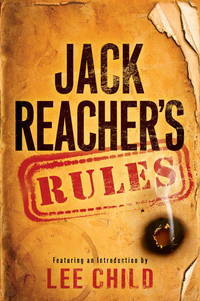 Jack Reacherâs Rules is the ultimate fanâs guide to the World of Reacher! Featuring selections from all seventeen Jack Reacher novels and an introduction from Lee Child himself, this one-of-a-kind book compiles timeless advice from maverick former army cop Jack Reacher, the hero of Lee Childâs blockbuster thrillers and now the star of a major motion picture. Please note:This book is a compilation of advice, wisdom, and facts from the Jack Reacher series of novels by bestselling author Lee Child. It features an introduction by Lee Child, but it is not a Jack Reacher novel. DELACORTE. New. 7.67 x 6.41 cm.